Respiratory infections in CF varies according to age. Because development of CF in the fetus requires each parent to pass on a mutated copy of the CFTR gene and because CF testing is expensive, testing is often performed initially on one parent. If testing shows that parent is a CFTR gene mutation carrier, the other parent is tested to calculate the risk that their children will have CF. 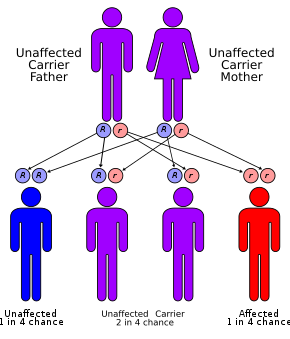 CF can result from more than a thousand different mutations. As of 2016[update], typically only the most common mutations are tested for, such as ΔF508 Most commercially available tests look for 32 or fewer different mutations. If a family has a known uncommon mutation, specific screening for that mutation can be performed. Because not all known mutations are found on current tests, a negative screen does not guarantee that a child will not have CF. During pregnancy, testing can be performed on the placenta (chorionic villus sampling) or the fluid around the fetus (amniocentesis). However, chorionic villus sampling has a risk of fetal death of one in 100 and amniocentesis of one in 200; a recent study has indicated this may be much lower, about one in 1,600. Economically, for carrier couples of cystic fibrosis, when comparing preimplantation genetic diagnosis (PGD) with natural conception (NC) followed by prenatal testing and abortion of affected pregnancies, PGD provides net economic benefits up to a maternal age around 40 years, after which NC, prenatal testing, and abortion have higher economic benefit. While no cures for CF are known, several treatment methods are used. The management of CF has improved significantly over the past 70 years. While infants born with it 70 years ago would have been unlikely to live beyond their first year, infants today are likely to live well into adulthood. Recent advances in the treatment of cystic fibrosis have meant that individuals with cystic fibrosis can live a fuller life less encumbered by their condition. The cornerstones of management are the proactive treatment of airway infection, and encouragement of good nutrition and an active lifestyle. Pulmonary rehabilitation as a management of CF continues throughout a person's life, and is aimed at maximizing organ function, and therefore the quality of life. At best, current treatments delay the decline in organ function. Because of the wide variation in disease symptoms, treatment typically occurs at specialist multidisciplinary centers and is tailored to the individual. Targets for therapy are the lungs, gastrointestinal tract (including pancreatic enzyme supplements), the reproductive organs (including assisted reproductive technology), and psychological support. The most consistent aspect of therapy in CF is limiting and treating the lung damage caused by thick mucus and infection, with the goal of maintaining quality of life. Intravenous, inhaled, and oral antibiotics are used to treat chronic and acute infections. Mechanical devices and inhalation medications are used to alter and clear the thickened mucus. These therapies, while effective, can be extremely time-consuming. Many people with CF are on one or more antibiotics at all times, even when healthy, to prophylactically suppress infection. Antibiotics are absolutely necessary whenever pneumonia is suspected or a noticeable decline in lung function is seen, and are usually chosen based on the results of a sputum analysis and the person's past response. This prolonged therapy often necessitates hospitalization and insertion of a more permanent IV such as a peripherally inserted central catheter or Port-a-Cath. Inhaled therapy with antibiotics such as tobramycin, colistin, and aztreonam is often given for months at a time to improve lung function by impeding the growth of colonized bacteria. Inhaled antibiotic therapy helps lung function by fighting infection, but also has significant drawbacks such as development of antibiotic resistance, tinnitus, and changes in the voice. Inhaled levofloxacin may be used to treat Pseudomonas aeruginosa in people with cystic fibrosis who are infected. The early management of Pseudomonas aeruginosa infection is easier and better, using nebulised antibiotics with or without oral antibiotics may sustain its eradication up to 2 years. Antibiotics by mouth such as ciprofloxacin or azithromycin are given to help prevent infection or to control ongoing infection. The aminoglycoside antibiotics (e.g. tobramycin) used can cause hearing loss, damage to the balance system in the inner ear or kidney failure with long-term use. To prevent these side-effects, the amount of antibiotics in the blood is routinely measured and adjusted accordingly. All these factors related to the antibiotics use, the chronicity of the disease, and the emergence of resistant bacteria demand more exploration for different strategies such as antibiotic adjuvant therapy. Aerosolized medications that help loosen secretions include dornase alfa and hypertonic saline. Dornase is a recombinant human deoxyribonuclease, which breaks down DNA in the sputum, thus decreasing its viscosity. Denufosol, an investigational drug, opens an alternative chloride channel, helping to liquefy mucus. Whether inhaled corticosteroids are useful is unclear, but stopping inhaled corticosteroid therapy is safe. There is weak evidence that corticosteroid treatment may cause harm by interfering with growth. Pneumococcal vaccination has not been studied as of 2014[update]. As of 2014[update], there is no clear evidence from randomized controlled trials that the influenza vaccine is beneficial for people with cystic fibrosis. Ivacaftor is a medication taken by mouth for the treatment of CF due to a number of specific mutations responsive to ivacaftor-induced CFTR protein enhancement. It improves lung function by about 10%; however, as of 2014[update] it is expensive. The first year it was on the market, the list price was over $300,000 per year in the United States. In July 2015, the U.S. Food and Drug Administration approved lumacaftor/ivacaftor. In 2018, the FDA approved the combination ivacaftor/tezacaftor; the manufacturer announced a list price of $292,000 per year. Tezacaftor helps move the CFTR protein to the correct position on the cell surface, and is designed to treat people with the F508del mutation. A 2017 Cochrane review found that ursodeoxycholic acid, a bile salt, had insufficient data to show if it was useful. Several mechanical techniques are used to dislodge sputum and encourage its expectoration. One technique is chest physiotherapy where a respiratory therapist percusses an individual's chest by hand several times a day, to loosen up secretions. This "percussive effect" can be administered also through specific devices that device chest wall oscillation or intrapulmonary percussive ventilator. Other methods such as biphasic cuirass ventilation, and associated clearance mode available in such devices, integrate a cough assistance phase, as well as a vibration phase for dislodging secretions. These are portable and adapted for home use. Chest physiotherapy is beneficial for short-term airway clearance. Another technique is positive expiratory pressure physiotherapy that consists of providing a back pressure to the airways during expiration. This effect is provided by devices that consists of a mask or a mouthpiece in which a resistance is applied only on the expiration phase. Operating principles of this technique seems to be the increase of gas pressure behind mucus through collateral ventilation along with a temporary increase in functional residual capacity preventing the early collapse of small airways during exhalation. As lung disease worsens, mechanical breathing support may become necessary. Individuals with CF may need to wear special masks at night to help push air into their lungs. These machines, known as bilevel positive airway pressure (BiPAP) ventilators, help prevent low blood oxygen levels during sleep. Non-invasive ventilators may be used during physical therapy to improve sputum clearance. It is not known if this type of therapy has an impact on pulmonary exacerbations or disease progression. It is not known what role non-invasive ventilation therapy has for improving exercise capacity in people with cystic fibrosis. During severe illness, a tube may be placed in the throat (a procedure known as a tracheostomy) to enable breathing supported by a ventilator. For children, preliminary studies show massage therapy may help people and their families' quality of life. Some lung infections require surgical removal of the infected part of the lung. If this is necessary many times, lung function is severely reduced. The most effective treatment options for people with CF who have spontaneous or recurrent pneumothoraces is not clear. Lung transplantation often becomes necessary for individuals with CF as lung function and exercise tolerance decline. Although single lung transplantation is possible in other diseases, individuals with CF must have both lungs replaced because the remaining lung might contain bacteria that could infect the transplanted lung. A pancreatic or liver transplant may be performed at the same time to alleviate liver disease and/or diabetes. Lung transplantation is considered when lung function declines to the point where assistance from mechanical devices is required or someone's survival is threatened. Newborns with intestinal obstruction typically require surgery, whereas adults with distal intestinal obstruction syndrome typically do not. Treatment of pancreatic insufficiency by replacement of missing digestive enzymes allows the duodenum to properly absorb nutrients and vitamins that would otherwise be lost in the feces. However, the best dosage and form of pancreatic enzyme replacement is unclear, as are the risks and long-term effectiveness of this treatment. So far, no large-scale research involving the incidence of atherosclerosis and coronary heart disease in adults with cystic fibrosis has been conducted. This is likely because the vast majority of people with cystic fibrosis do not live long enough to develop clinically significant atherosclerosis or coronary heart disease. Diabetes is the most common nonpulmonary complication of CF. It mixes features of type 1 and type 2 diabetes, and is recognized as a distinct entity, cystic fibrosis-related diabetes. While oral antidiabetic drugs are sometimes used, the recommended treatment is the use of insulin injections or an insulin pump, and, unlike in type 1 and 2 diabetes, dietary restrictions are not recommended. There is no strong evidence that people with cystic fibrosis can prevent osteoporosis by increasing their intake of vitamin D. Bisphosphonates taken by mouth or intravenously can be used to improve the bone mineral density in people with cystic fibrosis. When taking bisphosphates intravenously, adverse effects such as pain and flu-like symptoms can be an issue. The adverse effects of bisphosphates taken by mouth on the gastrointestinal tract are not known. Poor growth may be avoided by insertion of a feeding tube for increasing food energy through supplemental feeds or by administration of injected growth hormone. Sinus infections are treated by prolonged courses of antibiotics. The development of nasal polyps or other chronic changes within the nasal passages may severely limit airflow through the nose, and over time reduce the person's sense of smell. Sinus surgery is often used to alleviate nasal obstruction and to limit further infections. Nasal steroids such as fluticasone are used to decrease nasal inflammation. Female infertility may be overcome by assisted reproduction technology, particularly embryo transfer techniques. Male infertility caused by absence of the vas deferens may be overcome with testicular sperm extraction, collecting sperm cells directly from the testicles. If the collected sample contains too few sperm cells to likely have a spontaneous fertilization, intracytoplasmic sperm injection can be performed. Third party reproduction is also a possibility for women with CF. Whether taking antioxidants affects outcomes is unclear. Physical exercise is usually part of outpatient care for people with cystic fibrosis. Aerobic exercise seems to be beneficial for aerobic exercise capacity, lung function and health-related quality of life; however, the quality of the evidence was poor. The prognosis for cystic fibrosis has improved due to earlier diagnosis through screening and better treatment and access to health care. In 1959, the median age of survival of children with CF in the United States was six months. In 2010, survival is estimated to be 37 years for women and 40 for men. In Canada, median survival increased from 24 years in 1982 to 47.7 in 2007. In the United States those born with CF in 2016 have an expected life expectancy of 47.7 when cared for in specialty clinics. In the US, of those with CF who are more than 18 years old as of 2009, 92% had graduated from high school, 67% had at least some college education, 15% were disabled, 9% were unemployed, 56% were single, and 39% were married or living with a partner. Chronic illnesses can be very difficult to manage. CF is a chronic illness that affects the "digestive and respiratory tracts resulting in generalized malnutrition and chronic respiratory infections". 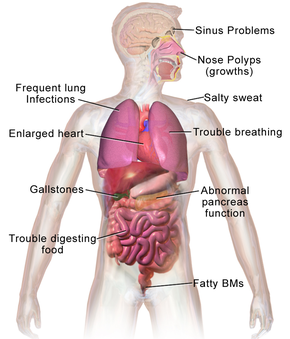 The thick secretions clog the airways in the lungs, which often cause inflammation and severe lung infections. If it is compromised, it affects the quality of life (QOL) of someone with CF and their ability to complete such tasks as everyday chores. According to Schmitz and Goldbeck (2006), CF significantly increases emotional stress on both the individual and the family, "and the necessary time-consuming daily treatment routine may have further negative effects on quality of life". However, Havermans and colleagues (2006) have shown that young outpatients with CF who have participated in the Cystic Fibrosis Questionnaire-Revised "rated some QOL domains higher than did their parents". Consequently, outpatients with CF have a more positive outlook for themselves. Furthermore, many ways can improve the QOL in CF patients. Exercise is promoted to increase lung function. Integrating an exercise regimen into the CF patient's daily routine can significantly improve QOL. No definitive cure for CF is known, but diverse medications are used, such as mucolytics, bronchodilators, steroids, and antibiotics, that have the purpose of loosening mucus, expanding airways, decreasing inflammation, and fighting lung infections, respectively. Cystic fibrosis is the most common life-limiting autosomal recessive disease among people of European heritage. In the United States, about 30,000 individuals have CF; most are diagnosed by six months of age. In Canada, about 4,000 people have CF. Around 1 in 25 people of European descent, and one in 30 of Caucasian Americans, is a carrier of a CF mutation. Although CF is less common in these groups, roughly one in 46 Hispanics, one in 65 Africans, and one in 90 Asians carry at least one abnormal CFTR gene. Ireland has the world's highest prevalence of CF, at one in 1353. Although technically a rare disease, CF is ranked as one of the most widespread life-shortening genetic diseases. It is most common among nations in the Western world. An exception is Finland, where only one in 80 people carries a CF mutation. The World Health Organization states, "In the European Union, one in 2000–3000 newborns is found to be affected by CF". In the United States, one in 3,500 children is born with CF. In 1997, about one in 3,300 Caucasian children in the United States was born with CF. In contrast, only one in 15,000 African American children suffered from it, and in Asian Americans, the rate was even lower at one in 32,000. Cystic fibrosis is diagnosed in males and females equally. For reasons that remain unclear, data have shown that males tend to have a longer life expectancy than females, but recent studies suggest this gender gap may no longer exist perhaps due to improvements in health care facilities, while a recent study from Ireland identified a link between the female hormone estrogen and worse outcomes in CF. The distribution of CF alleles varies among populations. The frequency of ΔF508 carriers has been estimated at one in 200 in northern Sweden, one in 143 in Lithuanians, and one in 38 in Denmark. No ΔF508 carriers were found among 171 Finns and 151 Saami people. ΔF508 does occur in Finland, but it is a minority allele there. CF is known to occur in only 20 families (pedigrees) in Finland. Cholera: With the discovery that cholera toxin requires normal host CFTR proteins to function properly, it was hypothesized that carriers of mutant CFTR genes benefited from resistance to cholera and other causes of diarrhea. Further studies have not confirmed this hypothesis. Typhoid: Normal CFTR proteins are also essential for the entry of Salmonella Typhi into cells, suggesting that carriers of mutant CFTR genes might be resistant to typhoid fever. No in vivo study has yet confirmed this. In both cases, the low level of cystic fibrosis outside of Europe, in places where both cholera and typhoid fever are endemic, is not immediately explicable. Diarrhea: The prevalence of CF in Europe might be connected with the development of cattle domestication. In this hypothesis, carriers of a single mutant CFTR had some protection from diarrhea caused by lactose intolerance, prior to the appearance of the mutations that created lactose tolerance. Tuberculosis: Another possible explanation is that carriers of the gene could have some resistance to TB. This hypothesis is based on the thesis that CFTR gene mutation carriers have insufficient action in one of their enzymes – arylsulphatase - which is necessary for Mycobacterium tuberculosis virulence. As M. tuberculosis would use its host's sources to affect the individual, and due to the lack of enzyme it could not presents its virulence, being a carrier of CFTR mutation could provide resistance against tuberculosis. Dorothy Hansine Andersen first described cystic fibrosis in 1938. CF is supposed to have appeared about 3,000 BC because of migration of peoples, gene mutations, and new conditions in nourishment. Although the entire clinical spectrum of CF was not recognized until the 1930s, certain aspects of CF were identified much earlier. Indeed, literature from Germany and Switzerland in the 18th century warned "Wehe dem Kind, das beim Kuß auf die Stirn salzig schmeckt, es ist verhext und muss bald sterben" or "Woe to the child who tastes salty from a kiss on the brow, for he is cursed and soon must die", recognizing the association between the salt loss in CF and illness. In the 19th century, Carl von Rokitansky described a case of fetal death with meconium peritonitis, a complication of meconium ileus associated with CF. Meconium ileus was first described in 1905 by Karl Landsteiner. In 1936, Guido Fanconi described a connection between celiac disease, cystic fibrosis of the pancreas, and bronchiectasis. In 1938, Dorothy Hansine Andersen published an article, "Cystic Fibrosis of the Pancreas and Its Relation to Celiac Disease: a Clinical and Pathological Study", in the American Journal of Diseases of Children. She was the first to describe the characteristic cystic fibrosis of the pancreas and to correlate it with the lung and intestinal disease prominent in CF. She also first hypothesized that CF was a recessive disease and first used pancreatic enzyme replacement to treat affected children. In 1952, Paul di Sant'Agnese discovered abnormalities in sweat electrolytes; a sweat test was developed and improved over the next decade. The first linkage between CF and another marker (Paroxonase) was found in 1985 by Hans Eiberg, indicating that only one locus exists for CF. In 1988, the first mutation for CF, ΔF508 was discovered by Francis Collins, Lap-Chee Tsui, and John R. Riordan on the seventh chromosome. Subsequent research has found over 1,000 different mutations that cause CF. Because mutations in the CFTR gene are typically small, classical genetics techniques had been unable to accurately pinpoint the mutated gene. Using protein markers, gene-linkage studies were able to map the mutation to chromosome 7. Chromosome-walking and -jumping techniques were then used to identify and sequence the gene. In 1989, Lap-Chee Tsui led a team of researchers at the Hospital for Sick Children in Toronto that discovered the gene responsible for CF. CF represents a classic example of how a human genetic disorder was elucidated strictly by the process of forward genetics. Gene therapy has been explored as a potential cure for CF. Results from clinical trials have shown limited success as of 2016[update], and using gene therapy as routine therapy is not suggested. A small study published in 2015 found a small benefit. The focus of much CF gene therapy research is aimed at trying to place a normal copy of the CFTR gene into affected cells. Transferring the normal CFTR gene into the affected epithelium cells would result in the production of functional CFTR protein in all target cells, without adverse reactions or an inflammation response. To prevent the lung manifestations of CF, only 5–10% the normal amount of CFTR gene expression is needed. Multiple approaches have been tested for gene transfer, such as liposomes and viral vectors in animal models and clinical trials. However, both methods were found to be relatively inefficient treatment options, mainly because very few cells take up the vector and express the gene, so the treatment has little effect. Additionally, problems have been noted in cDNA recombination, such that the gene introduced by the treatment is rendered unusable. There has been a functional repair in culture of CFTR by CRISPR/Cas9 in intestinal stem cell organoids of cystic fibrosis patients. Phage therapy is being studied for multidrug resistant bacteria in people with CF. A number of small molecules that aim at compensating various mutations of the CFTR gene are under development. One approach is to develop drugs that get the ribosome to overcome the stop codon and synthesize a full-length CFTR protein. About 10% of CF results from a premature stop codon in the DNA, leading to early termination of protein synthesis and truncated proteins. These drugs target nonsense mutations such as G542X, which consists of the amino acid glycine in position 542 being replaced by a stop codon. Aminoglycoside antibiotics interfere with protein synthesis and error-correction. In some cases, they can cause the cell to overcome a premature stop codon by inserting a random amino acid, thereby allowing expression of a full-length protein. The aminoglycoside gentamicin has been used to treat lung cells from CF patients in the laboratory to induce the cells to grow full-length proteins. Another drug targeting nonsense mutations is ataluren, which is undergoing Phase III clinical trials as of Հոկտեմբերի 2011[update]. ↑ http://emedicine.medscape.com/article/906209-overview#a2 Archived 2016-10-05 at the Wayback Machine.